Do You Eat More Sugar Than You Realize? 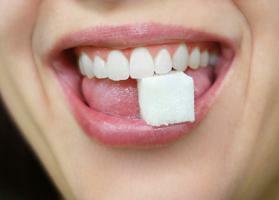 Everyone has heard that sugar is bad for your teeth and it is. That is a fact. But when you think about sugar, you are generally thinking about candy, sugar in your coffee or on your cereal and sugary drinks like pop. But these aren't the only sources of sugar. Sugar can be found in a lot of places, some are places that you would think are healthy. For example, fruit juices are frequently high in sugar, some of its natural, some of its added for flavor. The trick is that you have to start reading the ingredients list to hunt down the added sugar. Then you can make an informed choice. So Where Is This Hidden Sugar? To answer this question, let us start with the ways sugar can be hidden in an ingredient list. Let's start with the suffix “ose"". Anything that ends in “ose” is some form of sugar such as fructose, glucose, dextrose, sucrose, lactose, and maltose. They aren’t always alone in the ingredient list; you have probably seen high-fructose corn syrup or crystalline fructose. These are sugars and they are in everything from peanut butter to fruit drinks. In addition, there are other added sugars that show up in odd places. Corn syrup, corn sweetener, honey, molasses, honey and malt syrup are all added sugars. The word syrup should be a clue to you that this may be something sweet. Molasses syrup certainly is. Foods that you think of as healthy, and they are, can also have a detrimental side benefit of having too much sugar in them. For example, 1/3 of a cup of dried fruit can have 24 grams of sugar and not all of it is added. Agave is touted as a sugar substitute, may be a substitute for refined sugar but it is 85% fructose. Most fruit yogurt has 19 grams of sugar as well. That translates into almost five teaspoons of sugar. If you have any questions, or if you would like to learn more, please call us today at (425) 216-3367.